1. Put 1 tsp honey in a mixing bowl with the vinegar; season and stir together, then whisk in the olive oil. 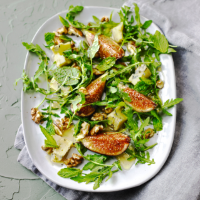 Add the figs, rocket, mint leaves and 2/3 the walnuts; toss everything together. Lightly toss the blue cheese through the salad. 2. Divide between 4 plates and trickle 1 tsp honey over each one. Scatter the remaining walnuts over the top, then drizzle over a thin trickle of olive oil. Finish with a grind of black pepper and serve.